An option from our Friends and Farms baskets. One that we enjoy during the summer, when our garden is producing the bulk of our vegetables, and Larriland becomes the source for most of our fruit. I miss the South Mountain Creamery truck at the Glenwood Market. 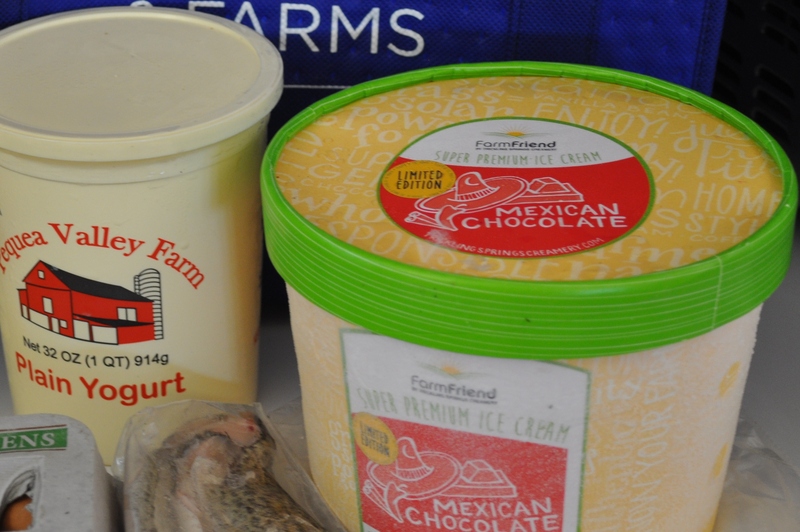 But, I am happy to report that you can get wonderful yogurt and ice cream and milk from Friends and Farms. This week’s protein and dairy bag, with a couple of add ons. The add ons. Pequea Valley plain yogurt. No sugar in it. Just plain yogurt. Thick, rich. The flavored ones are good too, in particular I love the maple yogurt. Still, plain yogurt can be used all sorts of places. As for that ice cream. If you love hot stuff, you must try it. If you are a heat wimp, you will freak at what is in this ice cream. Trickling Springs in Chambersburg PA makes this ice cream. It contains cinnamon, chipotle powder and habanero powder. Don’t say I didn’t warn you. I can’t eat it all by itself but I am thinking of one amazing milk shake. As for this week’s protein items we received. We got two lovely rainbow trout. Cleaned. Split. We grilled them with lemon and dill. Also, a couple of pounds of short ribs. They are in the freezer. Crock pot dinner later next week. My typical dozen eggs. Already gone. Frittatas. We don’t do whole milk. I choose to get a surprise veggie instead. This week. Beets with greens. 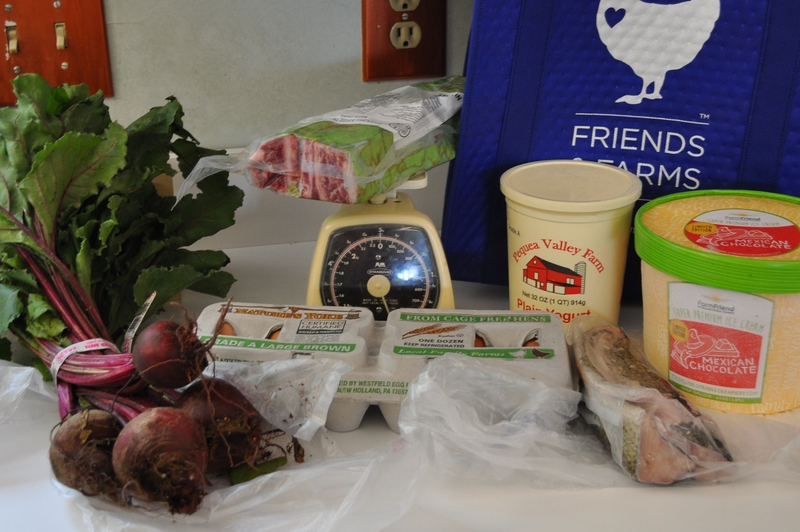 If you want really good meat and eggs and dairy, this is the way to go. Posted in Farmer's Markets, Farms, Food, Friends and Farms, Local Businesses, Locavore and tagged cooking, farmer's markets, Food, foodie, gardening, local businesses, Locavore, real food. Bookmark the permalink.